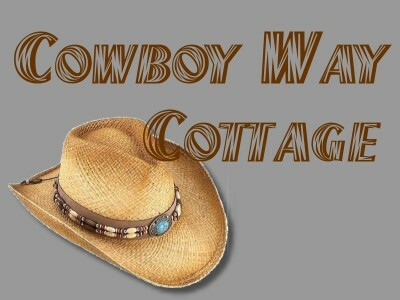 If you are seeking a vacation getaway that is affordable, fun and sensational, you must check out Cowboy Way Cottage! Ideally located between Nashville and Bloomington, this country charmer is within 15 minutes of anywhere you might want to go. Nestled in the trees high upon a hill, Cowboy Way Cottage offers outstanding views year 'round . Fishing, berry picking and hiking are all provided to you at the cottage. Yellowwood State Forest is just a short walk away for hiking enthusiasts hoping to catch a glimpse of a deer or do some bird watching. 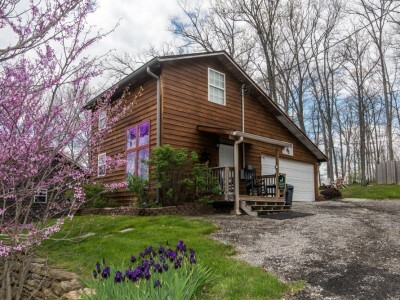 Located on a private county road that ends at Yellowwood State Forest, Cowboy Way Cottage offers one loft bedroom with a queen sized bed and 2 singles beds. This cozy bungalow has a living room with sleeper sofa, electric fireplace, 32" flat screen TV with satellite, DVD/VCR and a large window with a breathtaking view. Directly across from the living room is a fully equipped eat-in kitchen. There is one bathroom. Just outside the cottage, you'll find a relaxing, steamy, hot tub secluded by a large privacy fence, perfect for those romantic evenings away from it all! You will enjoy countless hours outdoors at Cowboy Way Cottage because there is always something fun to do! Build a camp fire and enjoy the quiet country air, with only the sounds of nature chiming in on occasion. Cook dinner on the grill and dine on the oversized private deck. It is amazing what a little fresh country air can do for the soul. Come, be our guests and discover the magic of Brown County. If you enjoy fishing on a private, fully stocked pond, then please bring your poles--the fish are biting! If you enjoy eating blackberries right off the bush (when in season) then Cowboy Way Cottage is the place for you. If you enjoy nature watching and hiking in State Forests, then you must come. If you enjoy horse back riding, Schooner Valley Stables are just a short drive away at the bottom of the hill. And finally, if you are looking for something fun to do after dark, Mike's Music and Dance Barn is just a hop, skip and a jump away. The Owners of Cowboy Way Cottage live on the same property as the cottage, adjacent to it , thus making it a home stay. They respect your privacy and will make every attempt to ensure that you are not disturbed in any way. The owners also offer discounted rates for Schooner Valley Stables and Mike's Music and Dance Barn for their overnight guests.